What if I'm already in a plan? 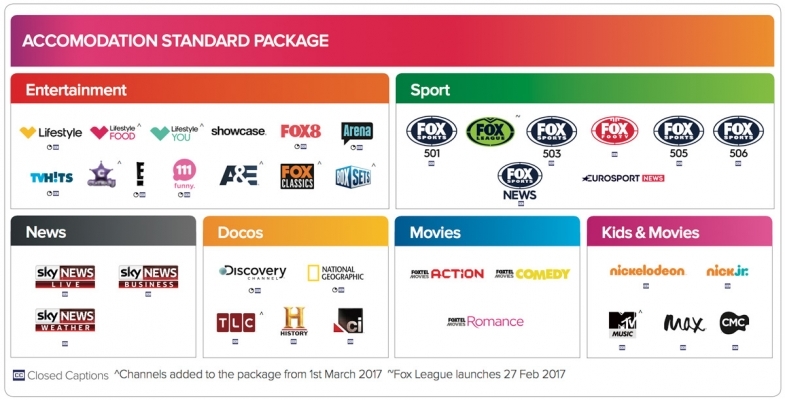 Similar to the Entertainment package, but for households with 6+ devices. Or for those who don't want to wait. Ever. 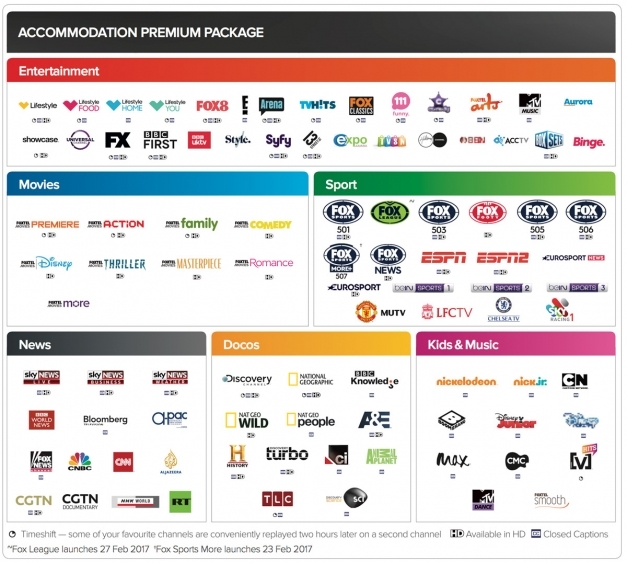 Foxtel’s Accommodation Standard and Premium packages offer the very best in in-room Entertainment. With a MyStar2 box and a Premium package, you can enjoy complete control of you viewing experience with the ability to pause, record and rewind live TV. A technician will attend your property to install and activate your service. Elypsys will provide you with everything you need to connect and activate your service at your leisure. Once you’re ready, call Elypsys to have your service activated. In just three easy steps you'll be on your way to awesome internet! Provide your name, address and important contact details and we will prioritize your account for connection. Once your apartment is connected we'll send you login details so you can pay online & have internet connected within hours. 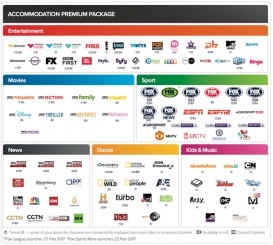 Choose 1 of 3 Unlimited Download plans, starting from as low as $65 per month on a min. 6 month contract. From Netflix to games and everything in-between, your experience is going to be like nothing you've ever had before. Because now you are getting business grade internet... All to yourself. If you already have an existing internet plan, we can still help you. Contact Us if you want better internet without paying more. At the end of the day, its internet how you expect it. No more wasting time. Up to 100MB/s plans. Download in minutes, not hours. Using Skype, Uploading to Dropbox, Accessing email and downloading files will all move quickly. Elypsys is a private telecommunications carrier, specialising in high speed data, voice and entertainment services. For more information about Elypsys, visit www.elypsys.com.au or free call 1800 ELYPSYS (359 779). Select your preferred plan above based on your needs. Once selected, you will be taken to the plan sign-up page where you will enter your details. Once your application has been processed, we will create your account and provide you with account login details so you can pay online and get connected within 24 hours. Alternatively, you can call 1800 ELYPSYS (359 779). What if I already have a contract with an existing provider? Contact your current provider to let them know you're moving. Once you have information from your current carrier, you can send us a message to servicedesk@elypsys.com.au or call us on 1800 ELYPSYS (359 779). Once you get your login details, login, enter your payment details and your internet will be switched on within 2 to 24 hours of payment confirmation. Who should I contact if I have any questions/how do u get in touch with you? We're here to talk. Call 1800 ELYPSYS (359 779) or email us at servicedesk@elypsys.com.au. How do I know which plan to select? If you're unsure of what will suit you best, contact our sales team on 1800 ELYPSYS (359 779) to discuss the right plan for you or send us a message to servicedesk@elypsys.com.au. How do I pay and what are the payment options available? In order to make sure you get your internet setup as quickly as possible, we offer online payment through Visa and Mastercard (debit or credit card), BPAY and Direct Debit. If you need assistance with your payment, you can email us at accounts@elypsys.com.au or talk to our support team at 1800 ELYPSYS (359 779). Do I need to pay for any additional equipment? When signing up for your plan, you will be notified of any additional equipment that may be required. This will be included in a 'setup fee' outlined when you pay for your service. Refer to elysee.elypsys.com.au for further details or call our support team at 1800 ELYPSYS (359 779). Is elypsys the NBN? What is different to NBN? Elypsys uses cutting edge technology to operate its own private high speed network, free from the constraints of NBN. This delivers a premium user experience, without a premium price tag. Can I choose another provider? The Elypsys network is an open wholesale network. Your provider is welcome to get in touch with us to arrange a service for you. Can I keep my existing landline phone number? Yes. Elypsys can arrange to port your phone number from your existing provider. A porting fee may apply. Can I keep my email address if it has been provided by another carrier? If your ISP is providing you with an email address, you will need to contact them to discuss your options of keeping that email address. Email accounts from providers such as Google and Yahoo will not be affected. Will Elypsys provide an email address? No. Elypsys will not tie you into a service by offering a 'free' email address. Elypsys recommends email services such as Gmail, Outlook, GMX, Yahoo and many more. Do I have to get a package or can I order products separately? Elypsys does not make you bundle products to get great value. Our offering consists of great value products that can be selected independently. If you have an urgent inquiry, you can free call us on 1800 359 779. Enquiries are directed to the network provider 'Elypsys'.